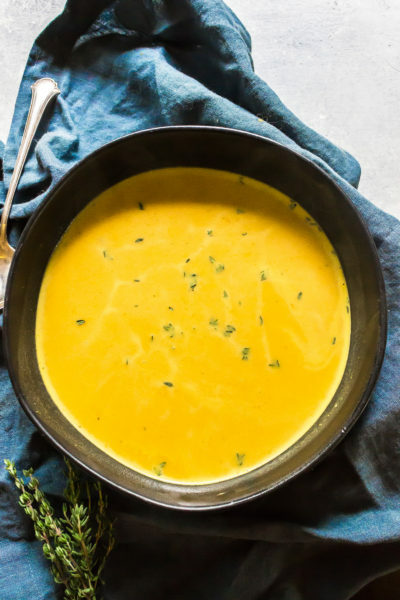 This easy Instant Pot Pumpkin Soup is perfect for fall! There are just a few simple ingredients and the Instant Pot serves as your saute pan and slow cooker for this soup. Set the Instant Pot to saute and add in the oil. Once hot, add in the onion, garlic, salt, pepper, and thyme. Saute for 4-5 minutes until starting to caramelize. Add in the pumpkin and broth, then place the lid on the machine and set to manual high for 8 minutes. Once the time is up, manually release the pressure. For a creamy soup, use a stick blender to puree the onions and garlic. Stir in the coconut milk and serve.